Researchers have built a sheet of nickel with nanoscale pores that make it as strong as titanium but four to five times lighter. A microscopic sample of the researchers' "metallic wood." Its porous structure is responsible for its high strength-to-weight ratio, and makes it more akin to natural materials, like wood. High-performance golf clubs and airplane wings are made out of titanium, which is as strong as steel but about twice as light. These properties depend on the way a metal's atoms are stacked, but random defects that arise in the manufacturing process mean that these materials are only a fraction as strong as they could theoretically be. An architect, working on the scale of individual atoms, could design and build new materials that have even better strength-to-weight ratios. In a new study published in Nature Scientific Reports, researchers at the University of Pennsylvania's School of Engineering and Applied Science, the University of Illinois at Urbana-Champaign, and the University of Cambridge have done just that. They have built a sheet of nickel with nanoscale pores that make it as strong as titanium but four to five times lighter. The empty space of the pores, and the self-assembly process in which they're made, make the porous metal akin to a natural material, such as wood. And just as the porosity of wood grain serves the biological function of transporting energy, the empty space in the researchers' "metallic wood" could be infused with other materials. Infusing the scaffolding with anode and cathode materials would enable this metallic wood to serve double duty: a plane wing or prosthetic leg that's also a battery. The study was led by James Pikul, Assistant Professor in the Department of Mechanical Engineering and Applied Mechanics at Penn Engineering. Bill King and Paul Braun at the University of Illinois at Urbana-Champaign, along with Vikram Deshpande at the University of Cambridge, contributed to the study. Even the best natural metals have defects in their atomic arrangement that limit their strength. A block of titanium where every atom was perfectly aligned with its neighbors would be ten times stronger than what can currently be produced. Materials researchers have been trying to exploit this phenomenon by taking an architectural approach, designing structures with the geometric control necessary to unlock the mechanical properties that arise at the nanoscale, where defects have reduced impact. Pikul and his colleagues owe their success to taking a cue from the natural world. "The reason we call it metallic wood is not just its density, which is about that of wood, but its cellular nature," Pikul says. "Cellular materials are porous; if you look at wood grain, that's what you're seeing? -- ?parts that are thick and dense and made to hold the structure, and parts that are porous and made to support biological functions, like transport to and from cells." "Our structure is similar," he says. "We have areas that are thick and dense with strong metal struts, and areas that are porous with air gaps. We're just operating at the length scales where the strength of struts approaches the theoretical maximum." 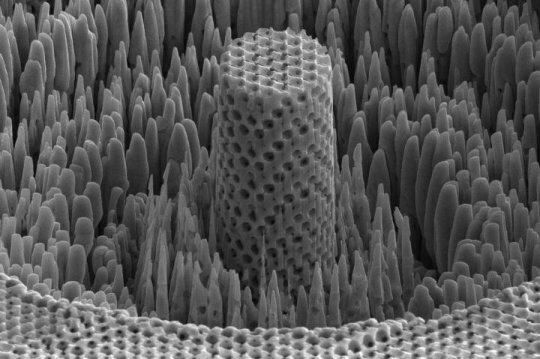 The struts in the researchers' metallic wood are around 10 nanometers wide, or about 100 nickel atoms across. Other approaches involve using 3D-printing-like techniques to make nanoscale scaffoldings with hundred-nanometer precision, but the slow and painstaking process is hard to scale to useful sizes. "We've known that going smaller gets you stronger for some time," Pikul says, "but people haven't been able to make these structures with strong materials that are big enough that you'd be able to do something useful. Most examples made from strong materials have been about the size of a small flea, but with our approach, we can make metallic wood samples that are 400 times larger." Pikul's method starts with tiny plastic spheres, a few hundred nanometers in diameter, suspended in water. When the water is slowly evaporated, the spheres settle and stack like cannonballs, providing an orderly, crystalline framework. Using electroplating, the same technique that adds a thin layer of chrome to a hubcap, the researchers then infiltrate the plastic spheres with nickel. Once the nickel is in place, the plastic spheres are dissolved with a solvent, leaving an open network of metallic struts. "We've made foils of this metallic wood that are on the order of a square centimeter, or about the size of a playing die side," Pikul says. "To give you a sense of scale, there are about 1 billion nickel struts in a piece that size." Because roughly 70 percent of the resulting material is empty space, this nickel-based metallic wood's density is extremely low in relation to its strength. With a density on par with water's, a brick of the material would float. Replicating this production process at commercially relevant sizes is the team's next challenge. Unlike titanium, none of the materials involved are particularly rare or expensive on their own, but the infrastructure necessary for working with them on the nanoscale is currently limited. Once that infrastructure is developed, economies of scale should make producing meaningful quantities of metallic wood faster and less expensive. Once the researchers can produce samples of their metallic wood in larger sizes, they can begin subjecting it to more macroscale tests. A better understanding of its tensile properties, for example, is critical. "We don't know, for example, whether our metallic wood would dent like metal or shatter like glass." Pikul says. "Just like the random defects in titanium limit its overall strength, we need to get a better understand of how the defects in the struts of metallic wood influence its overall properties." In the meantime, Pikul and his colleagues are exploring the ways other materials can be integrated into the pores in their metallic wood's scaffolding. "The long-term interesting thing about this work is that we enable a material that has the same strength properties of other super high-strength materials but now it's 70 percent empty space," Pikul says. "And you could one day fill that space with other things, like living organisms or materials that store energy."